As some of you may or may not know, I am coming up on the end of my six month internship. I have three weeks until I take the board certification exam and I cannot believe how fast the time has gone! Beginning the final month of internship has called for quite a bit of reminiscing. In that same spirit, I thought I would share with you what has been on my mind. Your major is “weird” and that’s okay. You will get your fair share of disapproving chuckles and confused looks when asked about your major but if you have faith in what you do, and you know the efficacy of what you do then that’s what matters. Take care of you. College is hard, and unfortunately life after college isn’t any less crazy. So take the time, rest, enjoy yourself, and find the balance because this isn’t a sprint, its a marathon. You’re going to be okay. There is no recipe for how to muscle through college and everything that is ahead of you so don’t worry about doing it right, just do it. You’ve got this. Wake up every morning and know that all of your hard work is for something, and that one day you will be proud of where you have been and how far you have come. Tabs HD: This is my absolute favorite app. It is essentially the application from the website www.ultimateguitar.com. The website itself is well known for its wide selection of chord and lead sheets. The selection is phenomenal and with the app you can have it all at your fingertips. I use it for on the spot song choice given a list of either my favorites or the Top 100. The app itself is free, but to use it to its fullest potential it requires a purchase of the service TabPro which can be paid by a monthly cost, or a one time fee. GuitarTuna: This is a straight forward tuner. I know, I know, there are so many tuner apps out there but this one is really fantastic. The image shown on the screen is of the head of the guitar and each note name is given next to its corresponding tuning key. It also uses different colors to correspond with the correct pitch and whether it is flat or sharp as you tune. This is a wonderful tool for lessons, adaptive lessons, and in general new learners! And the best part? Its free! Emotions: This app is very simple. It displays four images of people showing a certain expression, then it audibly says an emotion word and the player is supposed to choose the corresponding image. Now, what I love about this app is that it uses complex emotion words and at times it is difficult to differentiate, even for me. This is a tool that I use with some of our students with Autism and other disabilities to work past happy, sad, and angry, and really delve into identifying complex emotions. This app is also free. Relax M. HD: This app has many different sounds to choose from for the listener to create a customized relaxing audio. It includes anything and everything from light piano music to river and bird sounds. Also, once you have created your relaxing audio you can adjust the volume on each sound and put it on a timer. This is a great tool to use where your given client is particularly sensitive to certain sensory input as they can choose exactly what they like or find relaxing. In addition a relaxation script could be spoken over the chosen track. And again, this is a free app. Tiktik: Finally, this app has been a game changer for me. Tiktik is an organization app that is set up in a to do list format. You can create multiple lists which are color coded and if you choose, are incorporated into your master list. I love that this app actually has check boxes so when an item is completed I get the satisfaction of clicking the box and watching it disappear from my list. As an intern I keep my job, internship, and home life in separate lists and as everyday comes I can look at my master list and accomplish what needs to be done one day at a time. These are my absolute favorite apps. I hope you enjoy them as much as I do! Starting next week, we have 5 NEW CLASSES!!!! We have a class for everyone now. 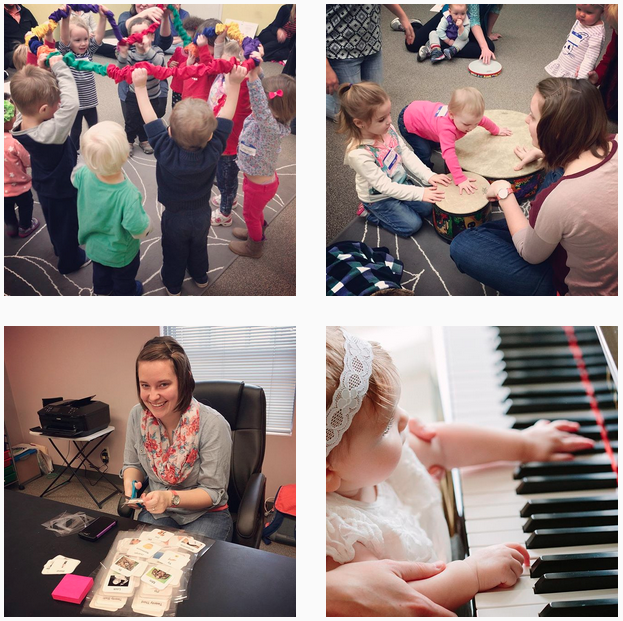 Whether you are an adult looking to learn a new instrument, a caregiver wanting their child to explore instruments or work on social skills, or a mom or dad looking for a class for your newborn or toddler, we have something for you! It was only two years ago that Rachel and I sat down and first talked about starting an LLC, leading weekly classes, and opening a studio space together. It was simply an idea two years ago and now things have taken off!! We are so excited by the incredible growth we have experienced and the immense support we have received from the community! We want to continue to support the needs and requests of community members so we are continually trying to improve and expand our services. As the year progresses, we will work even harder to provide the services you want!! Be sure to check out our new offerings and register today. As students, interns, and music therapists, I think it’s safe to say that we are a passionate bunch. And when you love what you do it can be very difficult to take a step back, even when it is absolutely necessary. This is something I have been dealing with for the past month, and it has been a great learning experience that I would like to share with you. The week that I came back from the holiday break, I began to have back pain which soon made it difficult to even get out of bed. After a doctors visit I learned that this is not a quick fix, and that it would be at least a few months before I would begin to feel the relief I was searching for. Now, this was all fine and dandy because I was entirely convinced that I could go full speed ahead and be just fine. Except the fact that it hurts when I play guitar. When I realized this, panic ensued and I felt the worry sweep over me… No, you cannot take my guitar. I understand that to other people, the attachment I have to my guitar might be odd, but I’m sure that I am in good company here. Soon thereafter I noticed that I was getting behind on my work, and that sitting in a chair and standing all day was not helping in the least. I began to feel overwhelmed and disappointed in myself. I had just passed the mid-point of my internship and I wanted to be able to do everything as planned so as to make the most of my short six months. It wasn’t until my supervisors Rachel and Katey spoke to me that I began to understand. Simplify. One of the first things my supervisors did for me after I returned was to list my weekly responsibilities in level of importance so when I sat down to work I knew what was most important to complete and what could be done another time. Simplifying also means accepting that I don’t have to use my guitar at every session. I have been strengthening my other accompaniment skills even more in the process. Streamline. Use your time practically, and effectively. I have been doing this by going to bed early and getting up early, because I have minimal pain in the mornings, and utilizing the bean bags at work versus a chair because they are much more supportive than an upright chair. These things increase my longevity, energy, and drive throughout my day. Self-Care. Here’s the big one. Stop, and self-care. It is essential. No questions asked. What I have found is that working this way feels good. It is productive and the work I do gets done faster. What I have found is not just a way to deal with an illness, pain… it is much bigger than that. This is the recipe for burnout prevention. Working with this level of simplicity, and a “make the best of your situation” attitude has been very effective for me. These are tools that have been so helpful to me, I wanted to share them with you.